Unlike rack-mounts or towers, a cube-shaped computer / Box PC can go pretty much anywhere. Most such industrial Box PC measure roughly 8 x 8 x 8 inches and weigh 10-12 pounds or so, and the EAC-PRO is no exception. Box PCs are in essence just general-purpose PCs equipped with plenty of I/O. So depending on a box's configuration, it can be used in all sorts of ways in areas such as factory floor HMI applications, vision systems, surveillance, signage, machine automation, medical imaging and many more. 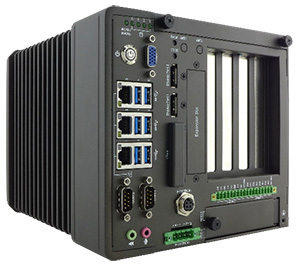 Note that while many embedded systems are designed and configured for very specific applications and come with just as much performance and I/O as is needed for the job, cubes are inherently multi-purpose and more flexible, providing plenty of performance and a whole gamut of I/O, and that applies to the Winmate EAC-PRO. So let's see what's under the hood of the Winmate EAC-PRO. That would be your choice of one of four available embedded Intel processors. All are of the 6th generation "Skylake" variety, i.e. recent, powerful, and very efficient 14nm designs. Winmate offers the Intel Xeon E3-1268L V5 processor; the Intel Core i7-6700TE, and then the Intel Core i3-6100TE. On the memory side, the EAC-PRO can accommodate up to 32GB of DDR4 RAM in two slots. Storage is essentially unlimited via two swappable and two on-board SATA 3 drives and RAID 0/1/5/10 support. If that's not enough, there's also SATA 2 CFast. As expected, the EAC-PRO excels in connectivity. 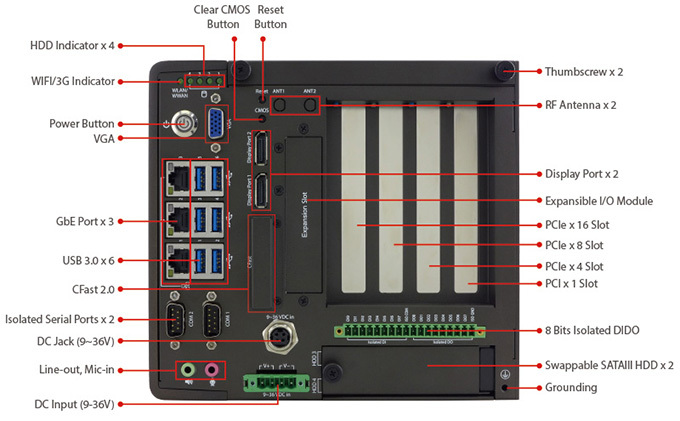 Externally accessible are six USB 3.0 ports, three gigabit RJ45 LAN jacks, 8-channel digital IO, and dual switchable serial ports. For video, there's VGA and two DisplayPort jacks, all three of which can be active simultaneously. Inside there are additional pin headers for four more COM ports, a legacy LPT port, PS/2, and also a couple of miniPCIe sockets for expansion. A total of four PCI expansion slots comes in two different SKUs.